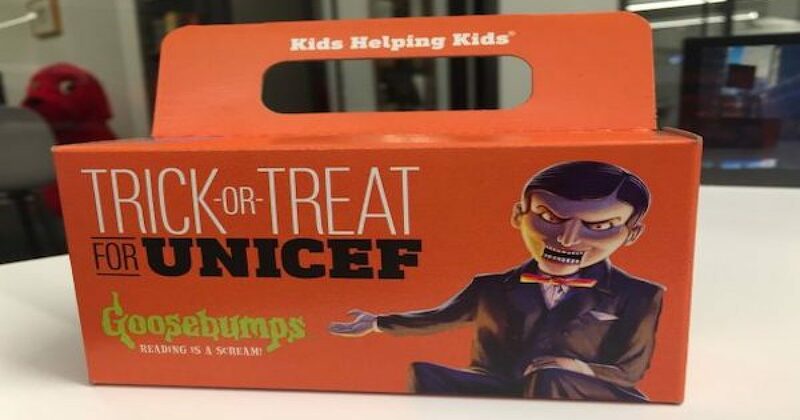 This Halloween Please Don’t Give Money To UNICEF !! This Halloween Please Don’t Give Money To UNICEF !! This Halloween Please Don’t Give Money To UNICEF !! The coming Tuesday millions of children across America will be putting on their scariest costumes and going door to door asking for candy. Its that Halloween time of the year again. Whether you are a parent or not, whether your children go “trick or treating” or not, I guarantee that your house is going to be swarmed by lots of little ghosts, zombies, Captain Americas, Disney Princesses and vampires. Many of the visitors will be carrying the little orange UNICEF boxes. Please remember when you greet the Kids, give them loads of wrapped candy but please don’t give any money to UNICEF. UNICEF supports terrorism, Antisemtism, and anti-Israel hatred. The March 2013 UNICEF report, “Children in Israeli Military Detention,” is yet another example of UN agencies collaborating with Palestinian advocacy NGOs to promote the demonization of Israel and promote Palestinian propaganda, rather than policy improvements. Furthermore, NGO Monitor has created a report called No Way To Treat A Child, (embedded below) which includes a section (beginning on page 8) which proves each of the charges in the UNICEF report to be wrong. UNICEF partially funds the British charity, Medical Aid for Palestinians (MAP) which according to the evidence provided by NGO Monitor, supports terrorism and Antisemitism, as well as promoting distorted and false narratives under the guise of medical expertise and scientific fact. MAP focuses on the “nakba” (catastrophe of the creation of Israel) as a central theme in its work. MAP has dedicated newsletters, reflections, and several articles on the topic. During a wave of terrorism that began in the end of 2015, MAP’s publications repeatedly criticized Israeli policy and actions, without even mentioning the attacks on Israeli civilians. MAP’s “2014 Gaza relief partners” included the Hamas-run Gaza Ministry of Health (MoH) and IDEALS, an NGO funded by Interpal, which the United States has designated a terrorist entity. In 2009 MAP enjoyed the profits of Seven Jewish Children, a play that was publicly condemned for antisemitic undertones. 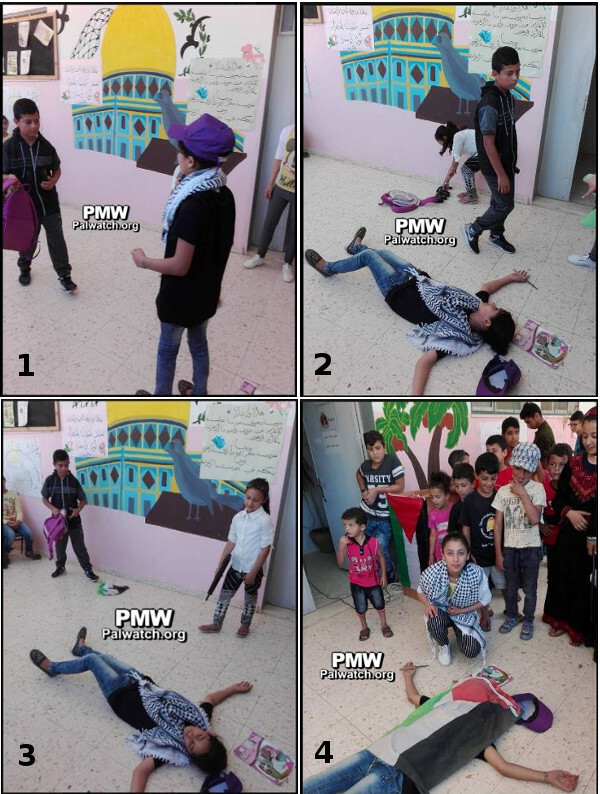 Note: Click here for more examples of UNICEF support of anti-Israel, pro terrorist activities from NGO Monitor. An ad for PYALARA, which is funded by UNICEF, demonstrates the organization’s support of Antisemitism. 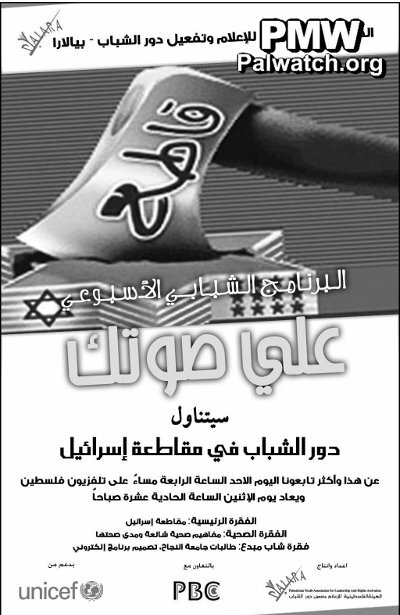 The ad (below) shows an axe destroying a Star of David. The large Star of David that has been destroyed is decorated with stars and stripes, presumably representing the USA, and an additional smaller Star of David – a common theme in anti-Semitic cartoons that imply Jewish control of the US. On the axe that destroys the Star of David is the word “Boycott!” in the imperative tense. This advertisement featuring anti-Semitic imagery also bears the UNICEF logo. Sadly there are many other examples of UNICEF supporting terrorism, Antisemtism, and anti-Israel propaganda. If you are interested in reading more my friend Elder of Zion has written about UNICEF extensively. The key is that if you do not support terrorism, Antisemtism, or anti-Israel propaganda.PLEASE don’t put your pennies in the orange box.